NEW Matt presents bias and operation data for the 6V6 tube in SE operation - 6V6 Single-Ended (SE) Ultra Linear (UL) Bias Optimization. Welcome to the DIY Audio Projects Message Forum. Use these forums to discuss Hi-Fi audio and to share your DIY Audio Projects. Registration is free and required to post messages and view the file attachments. Registration will only take a minute and registered users do not see any advertisements. After you have completed the online registration process, check your email (including spam/junk folder) for the verification email to activate your account. New members are under moderation - so your posts will not be visible until approved by a moderator. See the Read Me 1st, Forum RULES and Forum FAQ to get started on the forum. No export, but use all (both) heaters. Hi, The 5751 can be used on either 12 volts with the power applied to pins 4 and 5 (no connection to 9) or 6 volts if you tie pins 4 and 5 together and apply power between them and pin 9. The other tube is strictly 6 volts between Pins 4 and 5. If you look at the schematics for the amp you will see that both triodes in the tube are used. I drew up a turret board layout over the weekend. There will be some minor changes later on but I'm posting it for possible review as it is. It's similar to eshazen's layout in some ways. This is for a 3 1/8 inch hand drilled board. The tubes will be mounted to the chassis in a way where the 5751 drivers are furthest from the PT. It is per the V2C schematic, 220k resistor is going to the 1K/1W resistor instead of ground which I've picked up as a mistake in the latest schematic. Not bad for my first turret board layout? This post has a file attachment. Please login or register to access it. Only Registered Members may view attached files. I have the Poddwatt Version 2C running very well, but my needs have changed and I would like to use it as a power amp in a bi amp set up. Any thoughts on going about this and managing the negative feedback? Hi, It can be used that way. You can either just set the volume control at max or replace it with 100k resistors (across the input jacks - signal to ground for proper loading). What is the issue with NFB? Most amps have it to some degree and it has no effect on what the amps are used for. If you bi-amp then the other amp will also have NFB that only works on what ever part (high freq or low freq) that you set it for. What may be an issue is the phase relationship of the other amp. All Poddwatts are non-inverting if the other amp is inverting then the speaker leads on either it or the section of speakers it drives will have to be swapped (hot and cold) at either the amp end or the speaker end. Depending on the speaker system, you might have issues with its grounding arrangement. I would be sure that the upper and lower sections do not have a common ground. Looks pretty good, but I think you're missing a couple of parts on the grid of the output tube VT2, at least compared to the schematic I used. 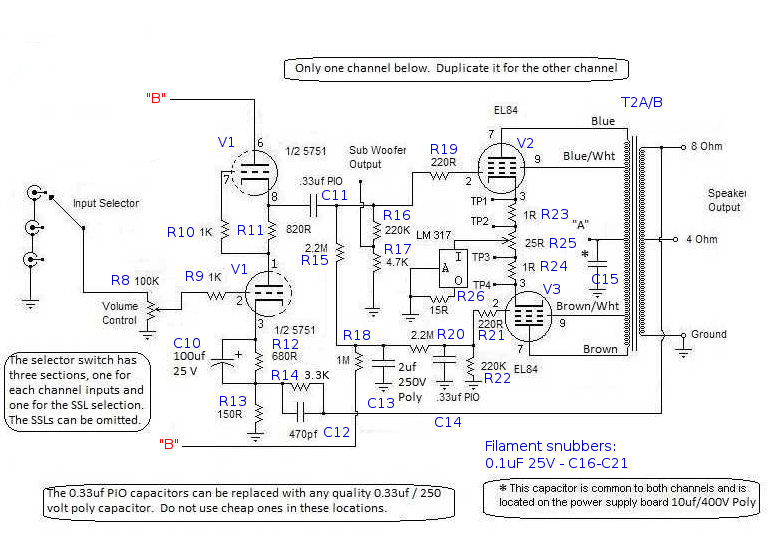 See the annotated schematic below I made for my PodWatt build. At least you need a cap to ground on the grid (pin 2) of VT2 (V3 in my schematic). VT1 and VT2 form a "long-tailed pair" or differential amplifier (see article: http://www.valvewizard.co.uk/acltp.html). There are two inputs on the grids of VT1 and VT2, and VT1 is driven by the input stage while the other input on the grid of VT2 must be grounded at signal frequencies, thus the capacitor C14 in my version of the schematic. If you make a successful PCB for a miniblock design like this I'd be interested in buying a couple off you. See this is exactly why I posted this up here. I completely missed a section and couldn't see it. Thanks for catching that. If I end up having PCBs made there will likely be a minimum order quantity beyond what I will need so we could share the cost. I will keep you updated in this thread. Do you need to use higher DC voltage rated caps for snubbing the heaters because its floated? No, you don't. The caps only "see" the voltage across the filaments themselves. (to be clear, they should be connected between the two terminals of each filament, not to ground). I think many folks omit them entirely.